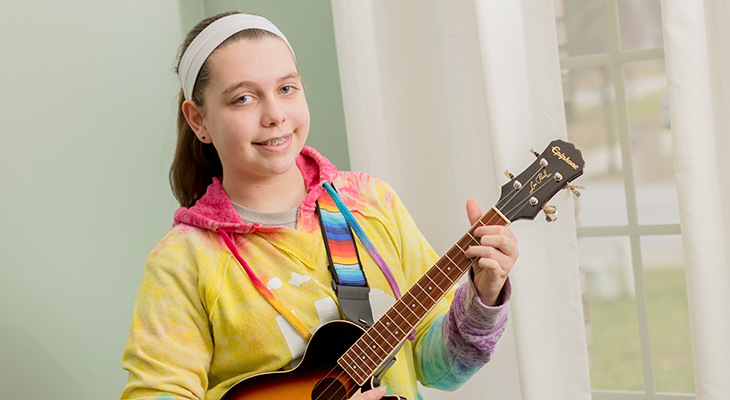 Music therapy gives young cancer patient new joy | Norton Children's Louisville, Ky. When acute lymphoblastic leukemia took away Lana Dobson’s greatest love — gymnastics — she was left with a void she thought she would never fill. From age 4, gymnastics was Lana’s life. She practiced six days a week and excelled in competitions. By age 8, she was on a path to compete nationally, with her sights on the Junior Olympics. Then, in 2016, at age 10, she injured her Achilles tendon during a warmup. When Lana’s pain wasn’t getting better, her orthopedic doctor ordered an MRI, which showed changes in the marrow of her leg bones. This led to a diagnosis of acute lymphoblastic leukemia. She was immediately taken to Norton Children’s Hospital to start treatment. As the family processed the news and the flood of emotions, they came to realize Lana’s passion for gymnastics was a blessing in disguise. “She is such an athletic girl. Her body was so strong to get through this,” Tiffany said. Many staff members on the 7 West teen cancer unit helped the Dobsons through their first night at Norton Children’s Hospital. Two nurses in particular quickly made a deep impression on Lana and her family — Meg Garl and Sam Franke. Even with great support and a skilled care team, Lana’s time in the hospital was not easy. The chemotherapy that was saving her was also causing damage to her legs. Lana lost interest in the things she once loved. She didn’t want to eat or drink. It was a dark time. Come hear Lana play and show your support for other kids like her Lana will be playing the ukulele with Brett Northrup in the Cancer Beats opening concert at Chili’s Clip for Kids on May 19. Her dad, Brian, along with members of her brother, Riley’s, football team from Silver Creek High School in Sellersburg, Indiana, also plan to show their solidarity by shaving their heads during Chili’s Clip for Kids. Chili’s Clip for Kids is an opportunity for the community to show support and raise awareness and funds for cancer care and research. All proceeds stay right here in our own community, benefiting Norton Children’s Cancer Institute, affiliated with the University of Louisville. Registration is free with a commitment to raise at least $25. Enjoy live music and family-friendly fun. Learn more and register. Cancer Beats concert • 1 p.m.
Clipping begins • 2 p.m.
Music therapist Brett Northup checked in on Lana regularly, doing his best to persuade her to take her mind off cancer by picking up a musical instrument. It was a struggle, but finally, after months of trying, Brett’s persistence paid off. Lana picked up a ukulele that Brett had left in her room. Then, in December 2018, Lana was dealt another blow: She would not be able to return to gymnastics. She poured herself into expanding her skills on the ukulele and guitar. She realized that she had a new way to express herself — just like what gymnastics used to be for her. Now, one year into remission, Lana can see beyond those dark days and wants to help other kids get through their challenges as they fight cancer. As the 2019 Chili’s® Clip for Kids honoree, Lana wants to let other families know that if she can get through it, they can too. That bigger family includes others on their own cancer journeys, as well as the caregivers at Norton Children’s Hospital, who dedicate themselves to providing not only lifesaving medical care but also crucial emotional support. “The 7 West team is the family you never knew you needed — but that you know you always have,” Sam said. Sam made such an impression on Lana that she is aspiring to become an oncology nurse.